Angela de Castro has been performing since the age of 17, beginning in her native Brazil where she was a well known actress in theatre, film and television, as well director of her own theatre company. She was a member of the original cast of the ground breaking show ‘Macunaima’ (1977-1980), which changed the face of Brazilian theatre and played to an audience of over ½ million people in Brazil alone, as well as touring internationally for over two years. In 1986 de Castro moved to London to pursue her dream of studying, performing and reclaiming theatre clowning as a modern art form. She has toured the UK and internationally with the major contemporary theatre and circus companies and is now a well known teacher of her master class ‘How To Be A Stupid’ or ‘The Art of Creative Intelligence’. Angela de Castro’s recent performing work includes ‘The Gift’ (Finland, Sweeden, Germany and Brazil), ‘Under Glass’, by the Clod Ensemble (London), ‘Laughing Matters’, by A de Castro, work in progress, Battersea Arts Centre London, Bristol Old Vic, Bristol and Jyvaskyla Festival Finland, ‘Luz Nas Trevas’ future length film (Brazil), ‘Futurology’ - National Theatre Scotland, Suspect Culture Theatre Co and Brighton Festival (UK), Ionesco’s ‘The New Tenant’ for the Young Vic Theatre (UK). She is well known for her clown Rough, the green clown, in the award winning Slava’s ‘Snowshow’. She creates and tours her own shows through her own company Contemporary Clowning Projects. Her shows include ‘The Gift’ , ‘My Life Is Like A Yo Yo’, ‘only fools, no horses’ (a show about the Shakespearean Fools). ‘Laughing Matters’, ‘Foreigners’ and her clown opera ‘Alleluia’, are projects in development. 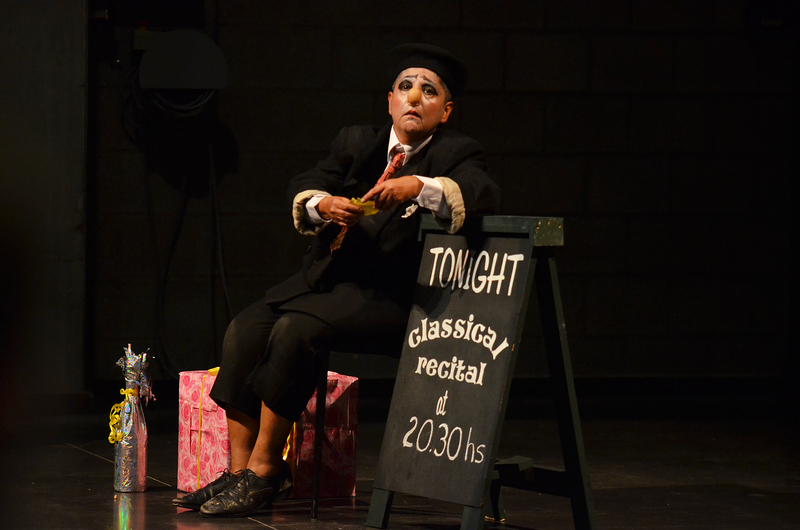 Angela de Castro is one of the most loved female clowns. She is a leading theatre practitioner, actor, theatre clown, teacher, director and speaker. Her performances and methodology have been well recognised in the UK and abroad, awarding her, among a few, a Lawrence Olivier Award (UK),the Golden Nose Award (Spain), the Nesta Dreamtime Fellowship, an Arts Foundation Fellowship and an International Fellowship from the Royal Scottish Academy of Music and Drama for her contribution to the art of clowning. Clowning is a life’s passion and way of life for de Castro. She doesn’t stop working. She is completely dedicated and committed to her work. She is always working on shows, directing and mentoring other companies, developing her own clowns’ personas and learning how to play the ukulele. When she has some free time, she can be seen browsing around street markets, riding her beloved motorbike and feeding the ducks in the park near her house.